Friends, its finally here. 2015. In the last post we reflected on the year and recounted some of the things we learned. As we step into a new year, I want to share my vision for 2015 with you. 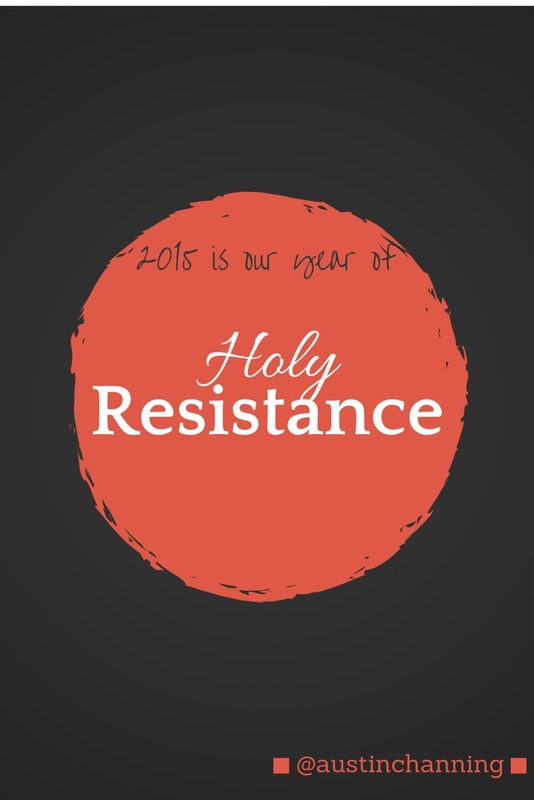 2015 will be our year of practicing Holy Resistance. I think this is what we've been doing for awhile now. Calling out racism. Challenging patriarchy. Naming brutality. Speaking truth. Going deeper. These are the actions of people who resist the status quo, who demand more. More justice. More peace. More of ourselves. More of the Church. We resist our comfort with things as they are- even as we move with hope into the future. The resistance we practice is not without foundation. It is a holy practice as we seek God and Gods word. It is holy because it is an imitation of Christ who was so focused on the kingdom of God that he regularly resisted this kingdom. Unlike most royalty, Christ's resistance was not based on "being above" the world, but diving into it. Literally. In 2015, we're going to keep diving, exploring, determining what it means to practice Holy Resistance. We'll do it together. Collectively. As the body of Christ, we need not practice alone. Reconciliation is meant to be done together. So this year, I'll be introducing you to my community, the loves of my life, the people I've been practicing with- some of them for years. I pray that you, too, find community. Its integral to this work. My plan for 2015 is to turn this site into a toolbox for you- to dismantle and to build, to help you practice holy resistance. The blog posts will be just one resource for you. I plan to add many, many more... but you'll have to keep coming back! As we start a new year together, lets stay connected by using the buttons on the right. You can sign up for my newsletter. It comes out once a month, so you don't have to worry about receiving a ton of messages from me. You can follow me on Twitter and Facebook; I often use both. Lastly, if you prefer to have new blog posts sent to your inbox, just write your email address in the feed burner box. I'm so excited about our year of Holy Resistance. Hope you're rested, because we have work to do in 2015!